Elizabeth’s mantra has always been, “a man’s home is his castle”, and having the ability to find you someplace that you love to come home to is what inspires her to work in real estate. As a former litigator, and coupled with her successful management of family-owned real estate for the past 16 years, Elizabeth has honed research, financial assessment, negotiation, and problem-solving skills that have enabled her to fulfill the dreams of many buyers by helping them to find and secure that perfect home. Conversely, for her sellers, Elizabeth employs tremendous effort and takes great pride in the details and presentation of their homes. With her astute pricing recommendations, her natural eye for staging (often with her own inventory of accessories), and her creative marketing abilities--she gives her clients, and their homes, the very best representation--regardless of property size or price range. 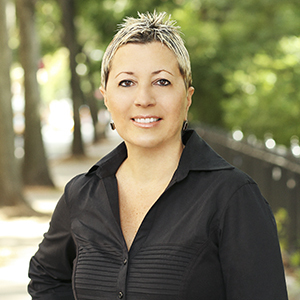 Elizabeth has lived or worked in just about every Manhattan neighborhood and offers you the very best service if you are in the market to buy or sell Manhattan real estate. She is a born and bred New-Yorker, and currently resides in the uber-chic Williamsburg, where new development continues to abound, and Manhattanites are settling in on a regular basis. In fact, given her residency and expertise in Brooklyn, assisting in the relocation of many such Manhattanites to many of Brooklyn's most desirable neighborhoods has become somewhat a specialty for her, as has the sale of Brooklyn properties. When she’s not engaged in seeking out your ideal castle--or selling it--Elizabeth loves to read, travel, garden, bike ride, cook for family and friends, and dine out. She is an ardent animal and bird lover (she has quite the caboodle of her own as well as 2 exotic parrots). This beautiful villa is located in the province of Novara. Located 70 km away form Milan, and only a 20-minute drive from the Malpensa airport. Other attractions nearby include: Ticino Natural Park, Lake Orta and Lake Maggiore. The villa consists of a main house and a guest house, which are connected by a charming covered walkway. The Golf Club membership is included in the purchase price.